Preliminary results indicate a gendered spatial perception of resources. 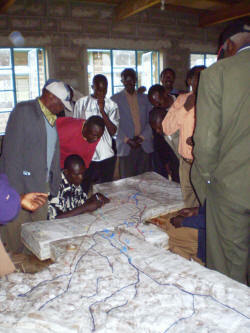 The P3DM Map was created using digital contour lines that had been digitized from survey maps. Random sampling of 4 administrative zones for participant selection, invite selected resident, begin exercise with an individual questionnaire quantifying the surrounding, after questionnaire completion begin 3-D model exercise and data extraction. Digital layers GIS have been created of mapped legend items for data storage/preservation and GIS analysis. (1) SUMAWA is a collaborative initiative for problem model assessment and human capacity building for the rehabilitation of the River Njoro watershed in Kenya. 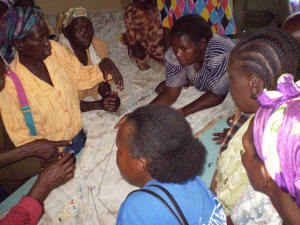 The multidisciplinary team is composed of faculty members from Egerton University, the University of Wyoming, the University of California at Davis, Utah State University and Moi University, as well as partners from other Kenyan institutions such as the Kenya Department of Fisheries and Kenya Wildlife Service. This project is a component of the Global Livestock Collaborative Research Support Program supported by USAID through a grant to the University of California Davis and by contributions from the participating institutions. 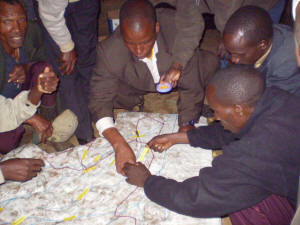 Technical assistance on participatory model building has been provided by ERMIS-Africa.